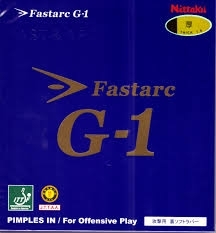 FastArc G-1 is a fast rubber with excellent rotation and high accuracy for aggressive offensive players. Designed to work near the table and for players who attach great importance to the first ball in rotation. The Fastarc G-1 has the most power of the series. It's a very direct and to the point rubber. All offensive strokes from fast drives at the table to long distance counterlooping are executed with high precision. The hardest and fastest of range. Recommended for attacking players who like to play both close and half distance from the table.